09:25:00 Makes about 5 dozen cookies or 64 servings, 1 cookie each. Makes about 5 dozen cookies or 64 servings, 1 cookie each. Wrap up your holiday baking with these tender cream cheese cookies. 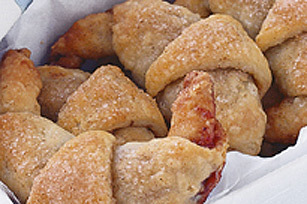 The raspberry jam provides a touch of sweetness to this flaky cookie dough. Beat cream cheese and butter in large bowl with electric mixer on medium speed until creamy. Gradually add flour, mixing until blended. (Dough will be very soft.) Divide dough into 4 portions; place each on sheet of plastic wrap. Pat each portion into 1-inch-thick circle, using floured hands. Wrap plastic wrap around each circle to enclose. Refrigerate several hours or overnight. Preheat oven to 325°F. Cover baking sheets with foil or parchment paper. Mix walnuts, 1/2 cup of the sugar and 2 tsp. of the cinnamon; set aside. Roll each portion of dough to 11-inch circle on lightly floured surface, lifting dough occasionally to add more flour to work surface as necessary. Spread each circle evenly with 1 Tbsp. of the jam; sprinkle with nut mixture. Cut each circle into 16 wedges. Roll up each wedge, starting from short end. Place, point sides down, on prepared baking sheets; shape into crescents. Sprinkle with combined remaining 1 tsp. cinnamon and 2 Tbsp. sugar. Bake 25 minutes or until lightly browned. Immediately remove from baking sheets. Cool on wire rack. Substitute pecans for the walnuts and/or apricot jam for the raspberry jam. Serving Size Makes about 5 dozen cookies or 64 servings, 1 cookie each.